The past week has been quite the week! School started for Elle (somehow she’s in 2nd grade already! ), and as prepared as we were for back-to-school, we didn’t anticipate getting taken out by a wicked cold and a severe case of pinkeye. The cold started with boyfriend over the weekend, then migrated to me by Monday evening. I may or may not have decided to push through work with a 102 fever, to try and save my sick leave for my kids. Because I was pretty sure they would catch our cold. Good news – they didn’t catch the cold! Bad news – by Thursday, my 2-year-old caught pinkeye from daycare. It is a good thing I saved my sick leave, because I had to take 2 days off work while his eye mended. The challenges of being a working parent are ever present, aren’t they? So the weekend came along, and I decided I deserved (read: desperately needed) a scalding hot, long, and luxurious soak in the tub. And not just any ‘ol soak – like a 30-minute soak with healing Epsom salts, relaxing essential oils, and absolutely no kids screaming in the background. 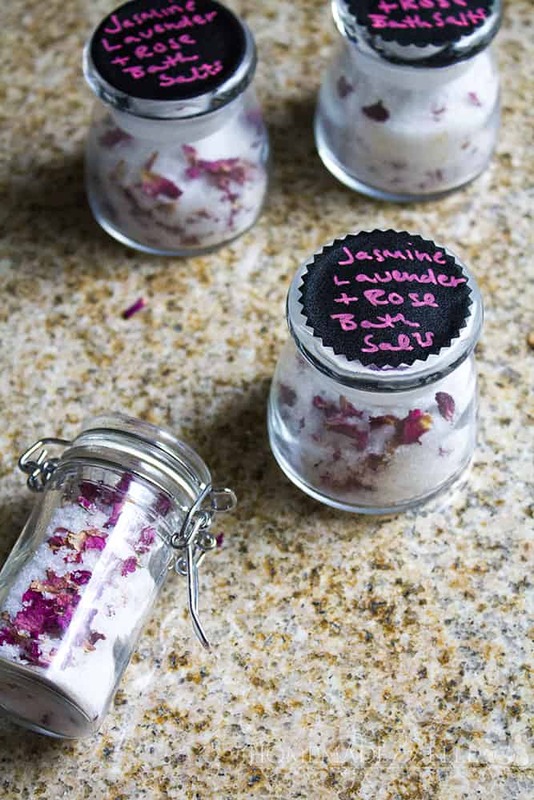 In anticipation of this much needed bath, I handcrafted this heavenly blend — Jasmine, Lavender and Rose Homemade Aromatherapy Bath Salts. It’s a combination of my 3 favorite fragrances, and creates such an incredibly relaxing experience for parents how have had an impossibly long week. 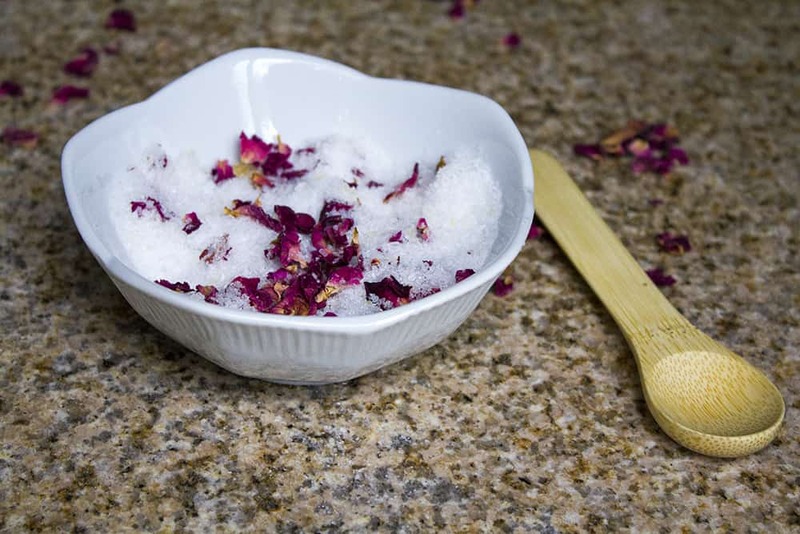 In addition to smelling wonderful, the Epsom salt helps soothe tired muscles while relaxing the body (source). After a few minutes in this tub, your worries will melt away. Combine all ingredients and mix together well. Store in a clean mason jar for up to 1 year. 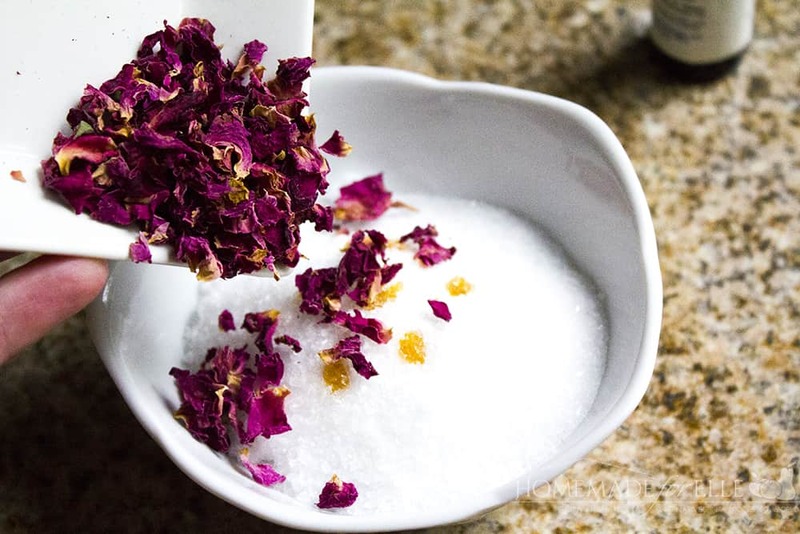 Add 1/2 cup of your homemade aromatherapy bath salts into a bath of warm water. Soak and enjoy! Several of my co-workers are also working moms that sent their children off to school last week, so I made a few extra batches to share with them! I had some of these spice jars I wasn’t using, which were perfect for enough homemade aromatherapy bath salts to last 1 – 2 soaks. I filled up the jars and added a chalkboard label to the top. If you want to share some other handcrafted goods with co-workers, friends or family members, here are some other easy recipes to try! 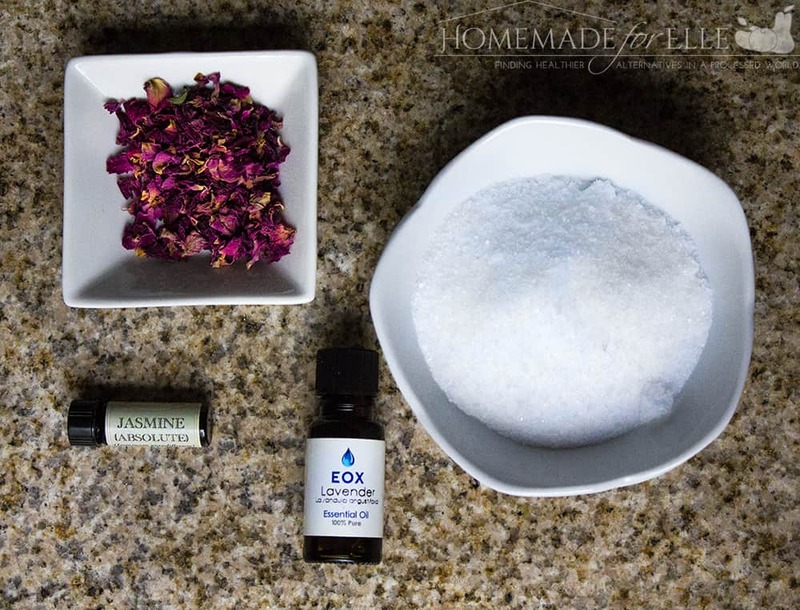 Want to try Aromatherapy Bath Salts, instead of making it? 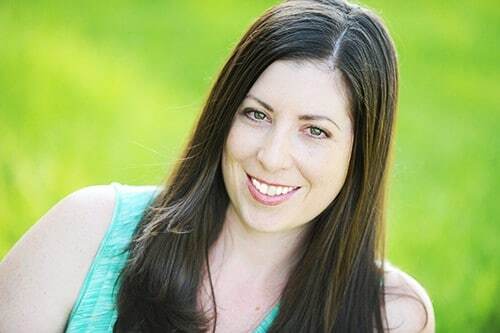 No problem – I’ve got you covered! You can buy this handcrafted item at my Etsy shop! 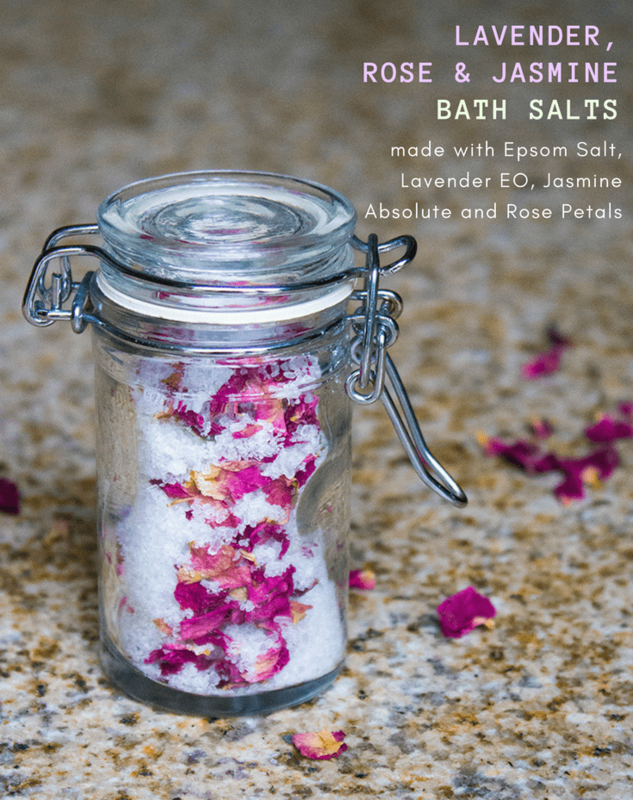 I hope you enjoy these handcrafted Aromatherapy Bath Salts! 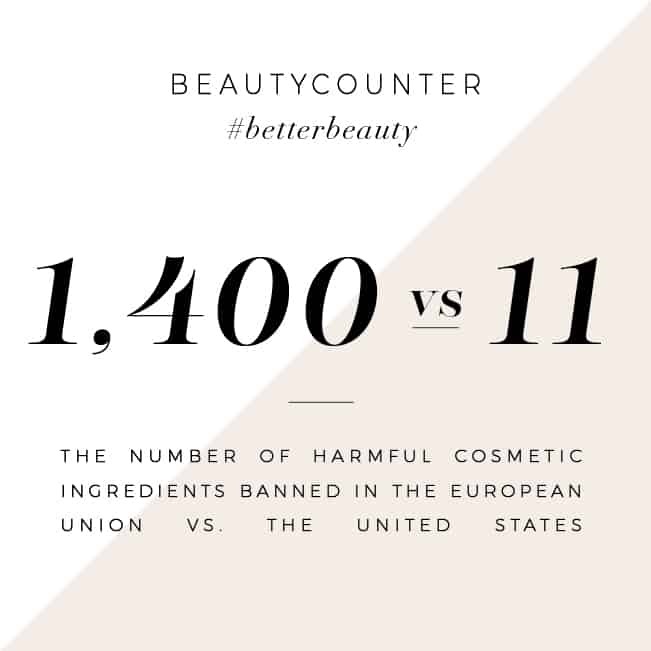 If you try them, please come back and leave a comment to share your thoughts on them! These are the prettiest bath salts I’ve ever seen. They’d make absolutely lovely gifts. Thanks Susan! I will see if I can mail you a batch next time I make them — they smell amazing!